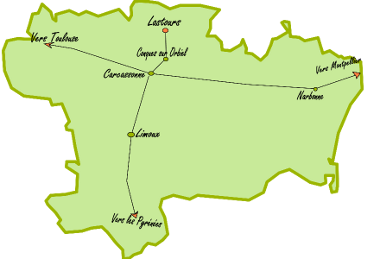 The construction of the Villelongue Abbey is initiated by a monk surnamed Guillaume in 1180 thanks to a donation granted in 1149 to the order of Cîteaux. The monks were originally from the Abbey of Bonnefont de Comminges. The power of the abbey appeared at the beginning of the 13th century thanks to Simon de Montfort. The latter rewarded the monks of Villelongue for their position against the Cathars. As a reward, he gave them many lands and the village of Saint-Martin-le-Vieil. The construction of the Cistercian church stretches until the beginning of the twelfth century. It will benefit from several extensions and elevations. But the plague raged in the fourteenth century, which began the decline of the abbey. During the Revolution, the abbey was taken by the revolutionaries, but the abbey was not completely destroyed and most of the sculptures remained intact. It was sold as a national property to a wealthy doctor, Guillaume Boussac, who turned it into a farm in 1791. The estate is then divided into two parts: on one side the ruins of the abbey, on the other a groupof houses, probably the old abbey house. The two parties were never assembled and belong to different owners. It was just in 1916 that the owners became aware of the cultural importance of the abbey of Villelongue and decided to do work there. During the same year the abbey obtains its classification to the historical monuments.